AltFi Data has today launched the first Index to track the historic returns available from the UK peer to peer and marketplace lending industry. 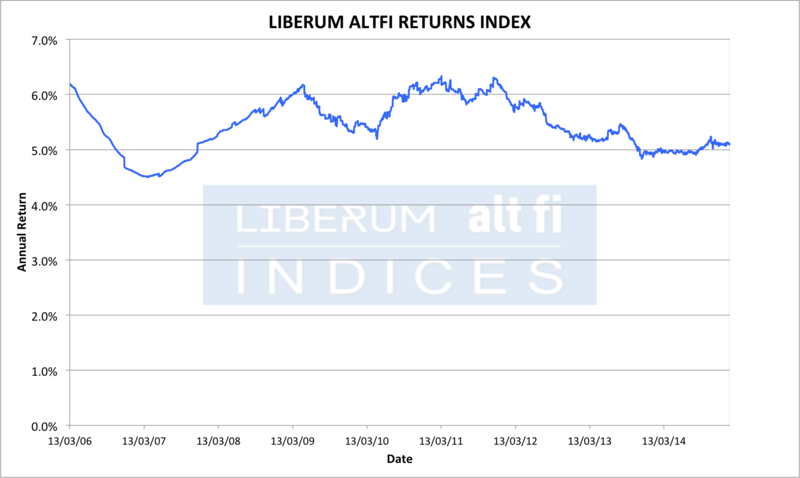 The Liberum AltFi Returns Index (LARI) accurately tracks historic marketplace lending returns using complete loan-by-loan cash flows provided by the major platforms. The index demonstrates the consistent returns that this sector has delivered. The latest data point shows a trailing 12-month return of 5.09% suggesting that this is what a fully diversified investor in the sector should have made in the last 12 months from a time weighted marketplace lending portfolio. To ensure maximum accuracy and transparency the Index is constructed using the cash flows from every loan made by the eligible platforms. As such, the Index factors in both defaults and recoveries to establish the real net return. Currently, the Index calculations are based on aggregated data from the 3 largest UK platforms – Zopa, Funding Circle and RateSetter. These platforms account for a 60% share of the UK marketplace lending sector as per the 3-month market share measure of the Liberum AltFi Volume Index. Platforms are eligible for inclusion if they satisfy specific eligibility criteria based around longevity, transparency and size. Transparency is central to these criteria. In an effort to ensure maximum clarity, on top of providing loan by loan cash flows to AltFi Data, all of the eligible platforms have agreed to publish significant loan book details publicly. These can be found on the AltFi Data website. "Transparency is absolutely crucial. It's our skin in the game, and will ensure we maintain the trust of our customers for the long term. AltFi Data has been a champion of data transparency and we welcome their new industry returns index which will be a useful tool for investors. Funding Circle has provided access to data on every loan we have ever originated for years, and this is something we hope the rest of the industry will also provide." The LARI uses a unique time weighting methodology to ensure that returns are not skewed by the effect of ‘seasoning’. This is an effect whereby in a fast growing sector defaults are out-weighted by the sheer volume of newly extended loans. Furthermore it is the only industry returns index of comparable detail to express the return in % terms to ensure that the output is meaningful to investors. Combined with a history dating back to 2006, AltFi Data are confident that this index will become the industry standard for the measurement of returns in much the same way that their volume indices are recognized as the most comprehensive and accurate measures of industry volumes.